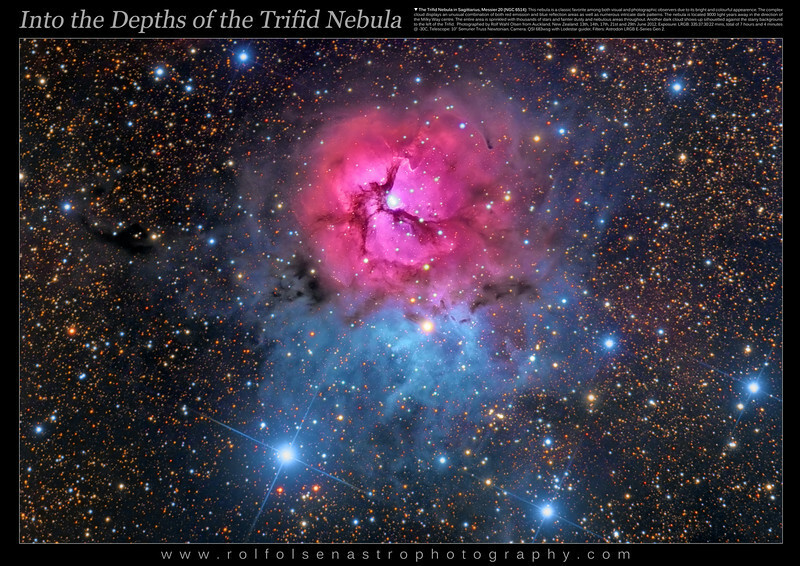 This poster shows the famous Trifid nebula in Sagittarius, also known as Messier 20 or NGC 6514. This particular nebula is a classic favorite among both visual and photographic observers due to its bright and colourful appearence. The complex cloud displays an unusual combination of both red emission and blue reflection areas as well as numerous intricate dark patterns. The nebula is located 9000 light years away in the direction of the Milky Way centre. The entire area is sprinkled with thousands of stars and fainter dusty and nebulous areas throughout. Another dark cloud shows up silhouetted against the starry background to the left of the Trifid. Near the top of the Trifid itself a curious example of gas evaporation can bee seen. A dense stalk, 8 light years from the central cluster, is emerging from the edge of the bubble surrounding the central cluster, and in the other direction a powerful stellar jet from a young star, HH 399 embedded in the gas, is shooting out in a direction towards the bottom right. The bright young stars in the central cluster emit strong radiation which eats away the surrounding gas and dust. The stalk only appears because a denser region lies at its very tip and protects a thin strip of the cloud from this interstellar erosion. The Hubble Space Telescope has imaged this fascinating area in high resolution. Also, the proper motion of the irradiated plasma in this jet has been measured and an interesting paper has been published detailing these findings.